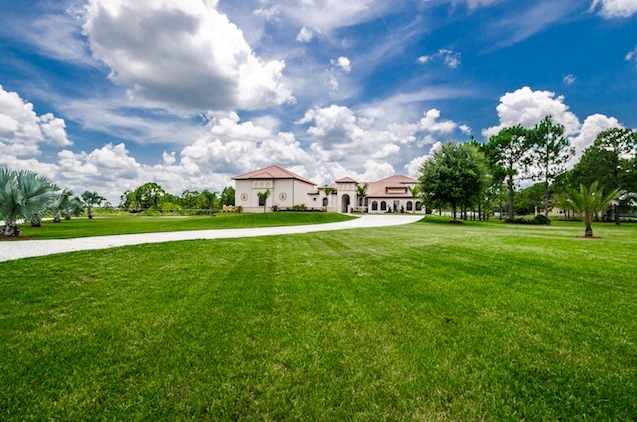 This palatial Naples home is in a class by itself. A 5 bedroom/4 bath estate, it basks in its 2.5 acre parcel & adjoining 2.5 acres. Stately wrought iron gates give gracious entrée to the winding drive framed by foliage to reveal an uncommonly stunning home featuring architectural adornments like lanterns, distinctive pavers & an elegant balustrade. Spectacular tile floors shine throughout the interior. Be transported by the absolute tranquility of the clean lines, uniquely arched doorways, tray ceilings, & sublime design details. The master suite is enviable with its resort-style bath, adjoining library & entrance to the pool area alongside the remarkable 30 x 34 covered lanai. A classically spacious formal dining room contrasts the rich woods & polished granite of the inviting kitchen & its cozy breakfast nook; both adjacent to the ideal family room’s triple sliders for a wall of sweeping views of the land & outdoor entertainment area. The upstairs bonus room with its own full bath could serve as a 5th bedroom, a music or art studio, a playroom, or personal fitness/training space. A separate office with outside entrance provides separation for your business/personal life, while the stand-alone 1692sf garage has a 6-8 car capacity & accommodates boats/heavy duty equipment with its towering 12′ x 16′ doors. There is pure quality in this home’s every facet. And in the evenings, you are rewarded with the most exquisite blanket of stars & feel you can reach out & touch the moon from your corner of paradise.